Dace are fascinating fishes. They are popular with specimen hunters, match fishermen and pleasure anglers alike, as well as serving like a ‘canary in a cage’ to tell us much about the health of the waters they inhabit. Dace are also eager to oblige the angler in virtually all conditions, be that under full sunshine or even when a frost paints the river banks. They can also be caught on everything from bread, hemp and maggots through to wet and dry flies and even small fry or lures. In so many ways, this ‘Prince of the ‘Stream’ can be considered the gamest of our coarse fishes. Perhaps it is surprising that ‘Dace: The Prince of the Stream’ is only the second book ever dedicated solely to this charismatic and widespread coarse fish. 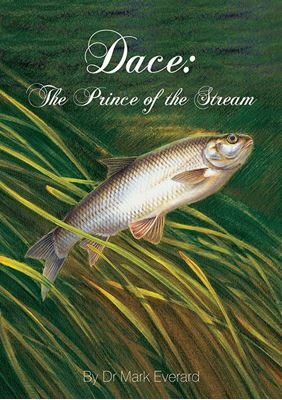 (The ‘How to Catch them’ book on dace was published well over 50 years ago.) This new book, generously illustrated in full colour, covers all aspects of the natural history of the fish, angling approaches, and the cultural context of the dace. These diverse dimensions are brought to life by well-respected scientist, author and broadcaster, Dr Mark Everard, who has a special affection for dace.